Leadership coach, Susanne Madsen, explains how to better collaborate with your team when you’re planning a project. Susanne noted in the video that the collaborative process she is focusing on for this tutorial is creating a milestone plan with your team members. Collaboration can happen in person and virtually. You can use tried and true materials such as pens and Post-It notes to get the job done. It doesn’t take any complicated technology, just old-fashioned project management. Pro-Tip: If you find brainstorming a noneffective method for creating a task list you might want to apply a newer version of the technique called brainwriting, which we’ve posted about here. Hi, I’m Susanne Madsen. 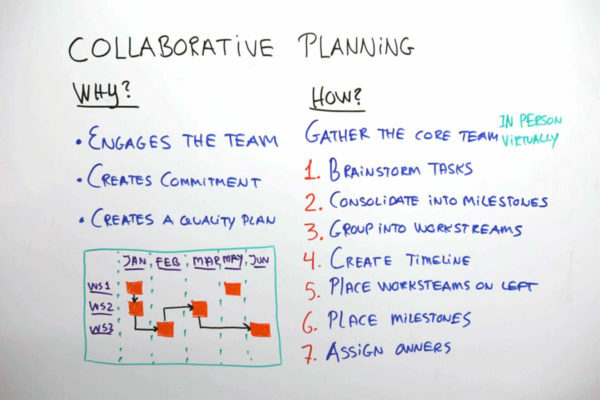 Welcome to this whiteboard session on Collaborative Planning. Collaborative planning in the context of this whiteboard session means that you are creating a milestone plan with your team by use of sticky notes. But why would you want to that? Well, first of all, it engages the team. That’s what you want. You don’t want to sit and do it all on your own behind your desk or behind your screen. That alienates people. You want to draw your team in and sticky notes is a very non-threatening user friendly way. It means that everybody wants to get engaged. It also creates commitment, because if you do the plan on your own, your team can say, “Oh, But the project manager did it. I wasn’t part of it.” And it means that they don’t take ownership. By drawing them in, you create that commitment. And thirdly, it creates a quality plan. Because when a whole team thinks together and brainstorms, surely it creates better output than if you do it all on your own. But how would you do it? Well, you’ve got to gather the core team together, either in person or virtually if your team doesn’t sit in the same location. If you’re fortunate enough to get your team together in one location, bring along sticky notes and marker pens. If you’re working in a collaborative virtual environment, investigate tools that can help you to do this virtually. There are tools available for that. The first step then is to brainstorm everything that needs to get done. Write down one task per sticky note. It doesn’t matter if people go into too much detail. What you want to end up with though are about 12 to 15 milestones across your project. So the step following is a step where you consolidate all of these tasks into major and minor milestones. As I said, aim for 12 to 15. After that you group your milestones into work streams. If you’re working on website project, you might have a work stream to do with server-side development, or another work stream to do with design or content. Then you need your timeline. Initially I suggest you just have months as a timeline, and you place them from left to right either on a brown paper or on a whiteboard or clip chart paper. Then you take your work streams and place them down the left hand side. And then the collaboration really starts again because now with your team you decide which milestones happen which month approximately, and in which work stream. We call those the swim lanes. Of course, what you’re having now is a high-level milestone plan. You will need to work in more detail to pin it down a bit more. But this is a great first step when you first start your project to get everybody together to work on what needs to happen and by when? And the last step of course is assigning owners. Who is going to own milestone? And must only be one owner per milestone. Good luck.